Every child needs to know these life skills listed below. As a parent, it is up to us to teach our children these basic skills so they can function as adults later in life. Being able to swim, cleaning up after themselves, doing their own laundry, knowing how to cook, and the list goes on. We as parents are responsible for teaching these life skills to our children! 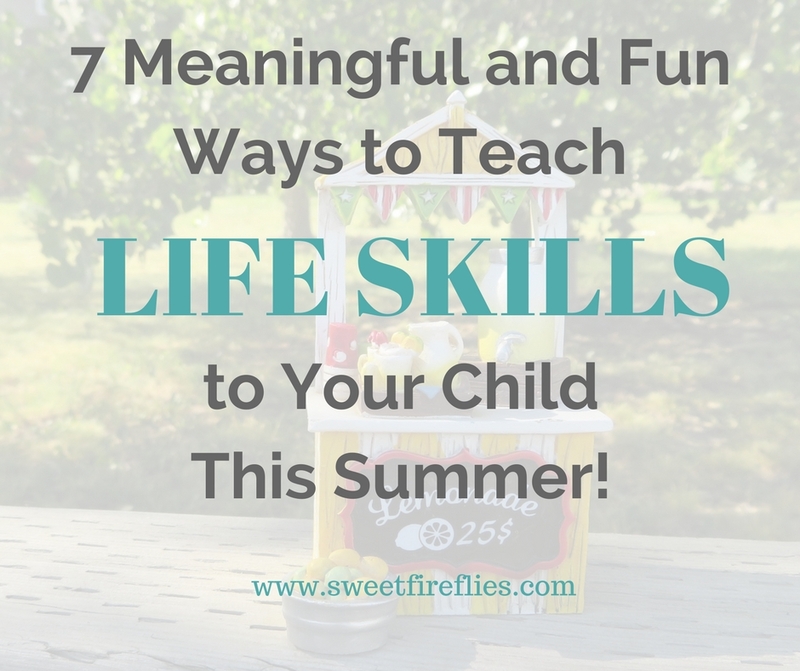 Below I will share a handful of ways to teach life skills in a fun way this summer to your children. They will have a blast and will not even realize they are learning valuable skills that will last a lifetime. Take the time to head outdoors and grow a garden with fresh produce. Let your child learn or help plant the seeds or little starter plants. Give them the task of watering them as they grow. Each day you can go out and water, check for any produce that needs to be picked and wait for things to grow. If you have a younger child they can help hold the hose with you, or older kids might be able to do it on their own with supervision. This is a great way for them to see and learn how to grow their own food. Try these tools for your little ones. No matter what your child’s age is they can learn to cook. Whether they help dump measured ingredients into the bowl, stir, or help in other ways, it is a great way to begin teaching the basics of cooking. Grab some produce you grew out of your garden, or whip up a tasty dessert they will be excited to help with. If you have a little older kid who knows how to read let them figure how much of each ingredient is needed. You can do the hard parts like putting items into the oven or cooking on the stove. For little kids let them help stir, dump ingredients, and just feel like they are a part of the dish. Let your child help make lemonade and get outdoors and start selling to neighbors. A lemonade stand will help teach them they have to work to make money. By making lemonade with your assistance, making (or investing in) a stand and sign, and then waiting for customers, it is a great early in life example. Then when they earn money that they have made, you can teach them to give, save, spend. Talk with them and help them understand the value of money. Earning money helps us buy the things we need and want. Will building a lemonade stand take more time than you have? Invest in their little business with this Melissa and Doug Lemonade Stand. Head to your local pool or water park and let your kids have fun splashing in the water. For little kids just introducing them to the water will help for later when they learn how to swim. Bigger kids you might find it is time to enroll in swim lessons and really can help work on building that life skill of knowing how to swim correctly. Knowing how to ride a bike is a great life skill. A balance bike is great for little kids. You might find it helpful as they transition to a full-on bike with no training wheels for older kids. Head outdoors on a beautiful sunny day and work with them on learning how to ride a bike if they don’t know how. It is a great way to spend the afternoon soaking up the sun. This life skill is more geared towards kids who are a little older. Give your kids like $5-$10, or better yet, take the money they earned from their awesome lemonade stand and head out to a few yard sales or a thrift store. Let them look around and find what they want to spend their money on. Help them to know if they can afford the item and what money is left after. This allows them the opportunity to decide if they want to wait for something better or buy that item and not have any money left. It is a wonderful way to really begin letting them see what it is like to use money and then not have anymore. Making decisions on what to spend or save is a great way to introduce them to financial literacy. Head out and create a treasure hunt for your kiddo. What a great way for them to learn about navigation but also super fun! Create a map that they have to follow clues to find the hidden treasure at the end. The best part is that you can do this right in your own backyard! What do you think of these suggestions? Do you have more to add? Comment below or follow us on Facebook and let us know.